Dana Hansen, editor of Hamilton Review of Books reviewed Belief in Quill and Quire's October 2016 print edition. It's reproduced here. Novelist Mayank Bhatt, who immigrated to Canada from Mumbai in 2008, delivers a taut,timely debut focused on one immigrant family and the devastating experience that threatens to destroy the life they have struggled to build in their new country. Having left their home in the 1990s to escape recurrent violence between Hindus and Muslims, Abdul and Ruksana Latif and their two adult children, Ziram and Rafiq, find themselves “misfits in Canada as much as they had been, as Muslims, in India.” Nevertheless, by the fall of 2008, the Latifs are relatively settled, with a home they own and jobs that promise more than mere survival. The family’s comfortable existence is thrown into turmoil when it is revealed that Rafiq may be involved in a terrorist plot to blow up a number of locations in and around Toronto. Rafiq’s questionable treatment at the hands of the justice system, and the family’s fear regarding the potential repercussions from his alleged crime, illustrate their terrible vulnerable position in Canadian society. At the novel’s end, the future for the Latifs is undetermined. It is clear that their lives have been irrevocably altered, though not entirely for the worse. Through the experiences of arrest and interrogation, Rafiq is forced to re-evaluate his religious faith, as well as his understanding of his parents; in so doing, he gains a clearer perspective on the older generation’s struggles. Konkona Sen Sharma has really large shoes to fill in as a director. Aparna Sen, Konkana’s mother, is an acknowledged auteur who has created at least two masterpieces – 36 Chowringhee Lane and Mr. and Mrs. Iyer – besides directing and acting many remarkable and memorable films. 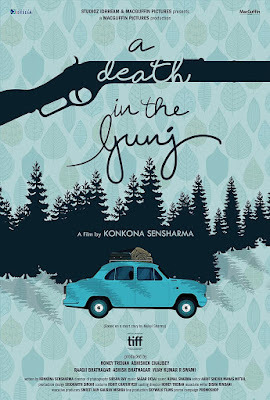 The consummate ease with which Konkana narrates the story of A Death in the Gunj (@aditg123) on celluloid it’d appear that in the years to follow, she’ll match her illustrious mother’s achievements as a film director. A Death in the Gunj is Konkana's debut directorial venture, and what is immediately evident is the languorous pace at which she lets the story unfold. Its deliberate slowness helps each character acquire distinctiveness. The film has an ensemble cast that includes newcomers and veterans. Konkana has also written the story (and it based on a true story her father Mukul Sharma told her). The story is set in 1979, and is of a family getting together in McCluskeigunj (then in Bihar, now in Jharkhand), a holiday resort that was built by and for the Anglo-Indian community that soon dwindled in numbers to the point of extinction. Even in 1979, the town has gone to seed, and nobody with any future lives there. The Sharmas – Ashok (Om Puri) and Anupama (Tanuja) – live in their crumbling mansion with a retinue of orderlies. Lunches are extended and comprise Mulligatawny Soup, and specially baked bread by the few Anglo families and dinners are over endless glasses of liquor; mornings begin with tea in the front verandah, and the afternoon tiffin is on the porch. A blue Ambassador, very much a Calcutta vehicle till recently, ferries the family to McCluskeigunj from Calcutta, and within the resort’s many splendid locales. The family is getting together to celebrate the New Year, with the young couple Nandu (Gulshan Devaiah), and Bonnie (Tillotama Shome, ) and their young daughter coming over from Calcutta for the year-end holidays. Nandu’s friends Vikram (Ranvir Shorey), and Jim Sarbh, are frequent visitors, having known the family since their young days. Accompanying Nandu and Bonnie are Mitali (Kalki Koechlin), Vikram’s former girlfriend, and Shyamal Chatterjee or Shutu (Vikram Massey), the nerdy, reticent, goofy guy everyone can’t stop teasing. The story is about the unobtrusive, seemingly mild but ceaseless bullying of Shutu by the group, and especially by Nandu and Vikram, and the terrible effect this has on Shutu. Everyone knows everyone else and is both comfortable as well as uneasy as a group. Shutu prefers to spend his time with Nandu and Bonnie’s young daughter and is barely able to conceal his contempt for Vikram, who, although now married to a local woman, and whose family treats him like some sort of royalty, seeks to continue his onetime relation with Mitali. Secrets spring out in the open with a monotonous regularity. For the group, these secrets aren’t really secrets because everyone is aware of them and ignores them. But with a monotonous frequency, these character flaws are exposed causing constant consternations and confrontations. The repressed anger, and the repressed lust and the not-so-repressed ennui rise to surface repeatedly, but everyone quickly tries to calm the ripples, so that life and the holidays can go on uninterrupted. But it all ends in a desperate act that leaves a deep impression on the audience, it’s a dénouement that is expected all along, but is immensely unsettling when it does come because it is sudden, stark and brutish. The gentle pace is aided suitably by Sagar Desai’s background score and the close-crop framing by Sirsha Ray’s cinematography. Among the cast, Om Puri as Ashok Sharma is flawless, Tanuja as Anupama Sharma is brilliant, Gulshan Devaiah as Nandu is competent, Tillotama Shome as Bonnie is understated, Ranvir Shorey as Vikram is over-the-top, but his role requires him to be so, Kalki Koechlin as Mitali is smouldering, but the film really belongs to Vikrant Massey, who as Shutu is perennially vulnerable, willing to be used and abused, even sexually; he’s outstanding. Cameroon Bailey, the artistic director of the Toronto International Film Festival introduced the film and conducted post-screening Q&A. Bombay loves celebrating two festivals – Ganapati and Govinda. The city and its people celebrate these festivals with an uncharacteristic abandonment of their normally taciturn demeanour. Public display of joy is not a Bombay trait; it is the reserve of the rumbustious northerners who celebrate every festival with unreserved frenzy. Bombay and its people avoid any break from their business-as-usual routine. But for Ganapati and Govinda, they let themselves go. Both the festivals have their roots in the congested, narrow lanes (gully) of the old city. They became popular when Bombay was not an unmanageable mega sprawl with a humongous population. With the shift of the population to the suburbs, these festivals have changed dramatically. I may be wrong, but I think that the move to the suburbs over the last four decades has reduced the significance of Govinda. The Ganeshotsav, on the other hand, has continued to grow. It is a multimillion-dollar festival. The ten-day festival brings out the best in a city that otherwise is fairly blasé about such matters. Lokmanya Balwantrao Gangadhar Tilak (1856-1920) launched the festival in 1893. The Keshavji Naik Chawl inaugurated the festival in Bombay. 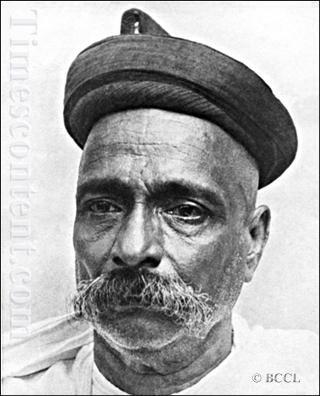 Tilak’s stated aim was to unite the people and to eventually mobilize them against the British rule. It advocated Swaraja (freedom) and Swawalamban (self-reliance). Indian historians have generally emphasized the nationalistic character of the festival and have tried to underplay its divisive roots. Although characterized as a political extremist, Tilak’s political career and his contribution to the nationalistic thought is so vast and complex, that it would do little justice to glibly parenthesize him into a narrow ideological category; especially so because of his exemplary effort in working with MA Jinnah to bring about Hindu-Muslim unity from 1915 up until his death in 1920. Had it been allowed to succeed, the 1916 Lucknow Pact would have transformed India’s Struggle for Independence. It is one of the most tantalizing ‘What ifs’ of Indian history. It is a different story that the collapse of the Lucknow Pact led to an ever-widening chasm between the Congress and the Muslim League. And, of course, in 1920, Tilak died, leading to the emergence of Mahatma Gandhi as the unquestioned leader of the Indian National Congress, a man Jinnah disliked intensely. The Tilak of 1916-1920 was not the Tilak of 1890s. In Tilak and Gokhale: Revolution and Reform in the Making of Modern India, Wolpert narrates the scalding conflict between the militant and the moderate components of the national movement. Emerging together from the Deccan Education Society, the nationalists were divided into two groups over the British intervention in raising the age of consent for marriage for Indian women. While not opposed to the reform, Tilak was opposed to government intervention in Hindu practices. But with the support of the moderates, the Bill was passed. The first of the modern public Ganapati festival began in Poona a week after the September meeting called to protest the Bombay riots. His gala ten-day celebration commemorating the birth of the Deccan’s most popular deity, the elephant-headed Ganesh, or Ganapati (“leader of the ganas,” that is, attendant upon Shiva) had originally been held as a family festival of the Peshwas and since their collapse, had fallen into the comparative oblivion of individual worship by less exalted households. Now, the public character of the festival was revived.